Do you have upcoming concerts? Why don't you play my music more often? This past winter, a test cybercast began on WGDR. It was very successful, and you can now hear Kalvos & Damian's New Music Bazaar live on-line every Saturday from 2:30 to 4:30 pm (1930 to 2130 GMT) with this link (which also cybercasts WGDR-FM during its normal 18-hour broadcast day). This link will always be available from K&D's home page or our net audio page -- the best place to bookmark it! An additional benefit of our RealAudio server is that our composer samples will be streaming as soon as we update their individual pages. We have an audio newsline of upcoming events in the new music world. We'll update it as often as possible as news releases stream in from composers. Find the RealAudio newsline here. Many of you discovered that most of our archived shows vanished from AudioNet -- nearly 100 Kalvos & Damian programs, including some of your favorite interviews. AudioNet will continue to offer the most recent shows, but along with WGDR's larger storage and bigger Internet "pipe" (courtesy of Goddard College) comes the return of the K&D program archives! There are more than 100 shows, including interviews with Jacques Bailhé, Clarence Barlow, Gary Barwin, Dennis Báthory-Kitsz, Marc Battier, Olexandra Beck, Anita Beckmann, Eve Beglarian, David Behrman, Henning Berg, Susan Bettmann, Peter Beyls, Gilles Yves Bonneau, Allison Cameron, Craig Bove, Joseph Celli, Joel Chadabe, Rhys Chatham, Nicolas Collins, Dennis Darrah, Maria de Alvear, Jody Diamond, Nick Didkovsky, Arpad Elo, Matthew H. Fields, David Gibson, Stephen Gryc, David Gunn, Daron Hagen, Tom Hamilton, Jeff Harrington, William Harris, Zeke Hecker, Fred Ho, Don Jamison, Udo Kasemets, Rip Keller, Chris Koenigsberg, Johan van Kreij, Drew Krause, Anne La Berge, John Levin, Benedict Mason, Thomas Massella, Elma Miller, Keith Moore, Erik Nielsen, Pauline Oliveros, John Oswald, Stephen Parkinson, Sarah Peebles, Troy Peters, Bea Phillips, Robert H.P. Platz, Larry Polansky, Eliane Radigue, Thomas L. Read, Kaija Saariaho, Phillip Silver, Linda Catlin Smith, Ann Southam, Laurie Spiegel, Rick St. Clair, Don Stewart, Carl Stone, Peter Tavalin, James Tenney, George Todd, Richard Tolenaar, Scott MX Turner, Peter Van Riper, Gwyneth Walker, Daniel Weymouth, a tribute to Conlon Nancarrow, and an original student opera. The complete list of these shows if found at our KalvoNet page. For those of you who have already heard our archived shows when they were available on AudioNet, you may want to listen to new shows recently posted, including interviews with Michael Arnowitt, Dennis Báthory-Kitsz, Susan Bettmann and Dennis Darrah of Dragon Dance Theatre, Joseph Celli, David Gibson, David Gunn, Stephen Parkinson, Bea Phillips, and Robert H.P. Platz. Our four latest shows can be heard on AudioNet, and earlier interviews are available on our KalvoNet page. Our most popular sections, Music Resources for Composers and Music Resources by Composers, are both undergoing a facelift. With research by composers David Robert Stewart and Prof. William Harris, the refreshed 2,000-link resource collection will be unveiled during April and May. K&D have been backlogged with submissions and changes, so more than a quarter of the resource list will be entirely new. We thank David and Bill, and invite you to check into our music resources pages as Spring unfolds. Kalvos & Damian's New Music Bazaar is a very costly project. K&D's fiscal agent is the Vermont Contemporary Music Ensemble, a 501(c)3 organization, and gifts to K&D are tax-deductible to the extent allowed. We are not presently funded by government or corporate grants, and only private contributions let the program continue, along with facilities generously provided by WGDR-FM and Goddard College. Please offer your support. For more information, contact us by email, or just write out your check to "Kalvos & Damian's New Music Bazaar" and send it to us at 176 Cox Brook Road, Northfield, Vermont 05663 USA. Gifts of DATs, blank CD-Rs, chrome cassettes, Zip disks, some nice traveling microphones, another portable DAT recorder, and other supplies -- as well as help with research and maintenance -- are also welcome. After a tightly scheduled year, our interview hours are now opening up. Beginning July 11, we'll have three months of live interviews and thematic shows. If you would like to return as a guest on Kalvos & Damian's New Music Bazaar (or if you haven't been scheduled yet! ), we'd love to have you on the show. Remember that we're now cybercasting, and the show is heard worldwide. Please contact us by email to Contact Form, telephone (+1-802-485-3972) or postal mail (176 Cox Brook Road, Northfield, Vermont 05663 USA). Many of you composers are popular with K&D listeners! (Bet you didn't know that!). Whenever you have new recordings, including good-quality concert recordings, be sure to forward us a copy. We can't play everything, but we try to keep our guests in our audience's ears. With cybercasting, that audience has grown dramatically. We also scan the covers of your recordings, and add the images to your web page. Forward your latest recordings to Kalvos & Damian's New Music Bazaar, 176 Cox Brook Road, Northfield, Vermont 05663 USA. Recently some of you have started actively using your K&D web pages, and you realize that you have a good, diverse audience coming to visit you. But some of your pages are getting stale -- old photos, music clips, catalogs, bios, and even incorrect email addresses or phone numbers, and changed homepage links. We actively submit pages to searchers, so fresh information is welcome; we update our pages every Saturday night, so please keep us updated. You can send us your text as an email, and you can send us photos and music clips as email attachments -- or through postal mail. We can use brief video clips (under 1 MB) on your pages as well. Some of what we use is listed below. Text: Please send us plain text -- no curly quotes, em dashes, or tabs. Please do not send text in word processor formats like MSWord, Claris, etc., or even HTML. We can also scan clearly printed or typed text--but keep in mind that working with catalog listings is time-consuming and they tend to go to the bottom of our pile! Electronic is better! Video clips: Send RealVideo (.rm), QuickTime (.mov), or Intel (.avi) via diskette or Zip disk. We don't have facilities to convert video for you, so we'll just post what you send. Photos: Send JPEG (depending on your software: moderate, good, #7, or 65% compression) as email attachments. Send .bmp, .tiff, .pcx and other uncompressed formats only on diskettes or Zip disks. You can send us photos as well (no slides, please) and we will scan them. Graphics: Unless they're small and crisp, please do not send .gif files. Give us the best quality file you can, and we'll make it right for our visitors. We can convert from your bitmapped version or scan your original, and will usually choose JPEG format so pages download quickly for all visitors. In the coming year, we would like to broadcast your audio art: essay, collage, composition, or other unique use of the audio medium. Just about anything creative you'd like to send in -- up to 10 minutes in length -- will be featured, and also added to your web page. For audio art, we would appreciate the material on DAT or CD, but high-quality cassettes can also be used. Send material to us at 176 Cox Brook Road, Northfield, Vermont 05663 USA. The commentaries and essays on the K&D pages are many and varied, and generate considerable public response. Send along some of your writings and we'll post them attached to your web page -- actually a web page suite -- and make sure they're found by searchers. Email a text copy to Contact Form, and include any illustrations, diagrams, etc., in JPEG or GIF format. If you have no electronic version of the materials, mail them to us at 176 Cox Brook Road, Northfield, Vermont 05663 USA -- we'll convert them and get them posted. One popular page is our graffiti page. Visitors love it, but we have few contributions of links from our guest composers. Check out how it works, and if you have links to some interesting things you're doing -- images, music, applets, writings, videos, etc. -- email the URLs to us. We have limited air time and virtually no budget, so some choices are made simply for our convenience -- and for this we apologize but hope you can understand. We two, the veritable Kalvos and Damian, choose the music, write the commentaries, conduct the interviews, edit the tapes, do our own engineering right down to transmitter logs, and prepare all the post-show RealAudio conversions and web page updates. Selections most likely to be played are great compositions (...had to say that!... ), under 15 minutes in length and recorded on CD. We play DATs when we're doing a special program or an interview, and then occasionally afterwards if they're well-marked (DATs without cue marks and length indications gather dust). We still like LPs if you've got 'em. Cassettes are last on the list because they're a nightmare to cue during a live show, are impossible to index, and they suffer sonically. We understand that it's too much to ask that every composer make copies of music on CD, but all other issues being equal, keep in mind that we'll grab a CD before any other format. 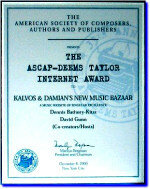 Kalvos & Damian's New Music Bazaar is a very costly project, and unlike Artswire, American Music Center, etc., we do not ask that our composer guests be members or pay for their web pages. But we do need support, and several composers and fans of new music have been generous. We thank them again here. K&D's fiscal agent is the Vermont Contemporary Music Ensemble, a 501(c)3 organization, and gifts to K&D are tax-deductible in USA to the extent allowed. We are not presently funded by government or corporate grants, and only private contributions let the program continue, along with facilities generously provided by WGDR-FM and Goddard College. Please offer any support you can. For more information, contact us by email, or just write out your check to "Kalvos & Damian's New Music Bazaar" and send it to us at 176 Cox Brook Road, Northfield, Vermont 05663 USA. Gifts of DATs, blank CD-Rs, chrome cassettes, Zip disks, some nice traveling microphones, another portable DAT recorder, and other supplies -- as well as help with research and maintenance, and keeping your own K&D page fresh -- are also welcome.